Most of the blogs I read are homesteading or microfarming sites and for the past month have all had scant posts mainly consisting of “Haaaalp, there are not enough hours in the day!” Which I can relate to. I simply cannot get it all done between dawn and dark, no matter how hard I work. On the bright side, my chronic insomnia is at an all time low due to overwhelming exhaustion by the time I collapse into bed. It’s just been one problem after another. Something ate all the blueberries; gotta net the plants. Something is eating all the blackberries, gotta make a tree-limb-n-twine-lashing fence around them. Something died out in the woods and the dogs keep dragging home greasy bones, a pelvis here, a femur there; gotta find whatever it is and bury it. Why are the huckleberries dying? Not enough nitrogen says the internet; time to pee in a bucket, mix in a gallon of pond water, and use it to fertilize them (studies reliably show that human urine, which contains nitrogen, phosphorus and potassium, is an excellent replacement for chemical fertilizers, and provided you aren’t sick, it’s pretty much sterile, though you might not want to use it when the plant is actively giving fruit that you are harvesting). And on and on. So much work, so little yield yet. Do you realize those wild-eyed preppers are right, we’ll all die if the electric grid goes down because none of us knows how to produce our own food successfully? I never really believed it until this summer when I’ve worked so damn hard just to keep everything from out-and-out dying, let alone yielding anything edible. But let’s talk about those turkeys. …so I was really looking forward to seeing how the Whites turned out. I was so shocked I could hardly speak. I keep a very clean coop if I do say so myself, frequently cleaning feeders and waterers with disinfectant and letting the birds out to free range all day. How could my birds not be healthy? They’d looked and acted just fine. The ladies who slaughtered them came out to chat with me and said it just happens sometimes. One of them told me she raises turkeys herself and sometimes the inspector condemns them. They told me they process around 500 head of fowl per day and on average the inspector condemns about 20 birds. Still, I fretted about it all evening and tried to find information online about how to prevent this from happening again, but I could not find much information aimed at the small-time backyard turkey producer. What I found was publications generated by the poultry industry, which I started to read with interest. Last year, around 1% of turkeys were condemned after slaughter, which is significantly better than my 50% condemned rate, though it’s not really comparable since I had only four birds. But guess who has much higher rates of condemned birds? Antibiotic-free producers! Ahhh, that makes a lot of sense…my birds had septicemia, which is usually caused by E.Coli infection, and guess what we never, ever give any of our poultry? Antibiotics. If you are committed to raising them antibiotic-free, expect to lose significantly more birds, either due to mortality or due to being condemned at the time of slaughter. Make sure to buy twice as many poults as you want finished turkeys. Antibiotic-free poultry production: Is it sustainable? Turkeys are friendly toward humans but somewhat aggressive toward each other and other varieties of birds. Use Blue Kote to deal with pecking injuries. Given them half a head of cabbage suspended on a rope in the brooder so they have something to peck at while they’re little so they don’t get in the habit of pecking one another. Turkeys and chickens cannot be raised together due to the risk of the turkeys contracting Histomonas meleagridis from the chickens, which causes Blackhead disease. 4.Turkeys are excellent free-rangers and want to be out and about all day from an early age. Plan for this. 5. It can be hard to find feed for turkeys. 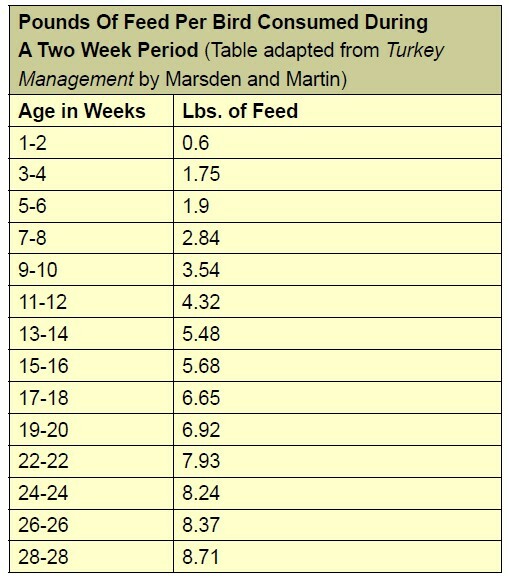 You need to start them out on 26-28% protein; we found a game bird feed that worked for this. You can lower the protein to 20-24% later and then finish them out on 16% to get a nice layer of fat on them before slaughter. Withhold food for at least 15 hours before slaughter so that the crop and intestines will be mostly empty. 6. They need a much larger coop than you think if you are raising BBs. Our coop quickly grew too crowded. 7. Unbelievably, they seem to like to get in water. Maybe ours were just imitating the ducks and geese, but they would actually get in the pond to cool off on hot days. One saw my husband on the other side of the pond and swam all the way across to him! I wish we’d gotten a picture of that absurd sight. Anyway, if you don’t have a pond, your jakes and jennies (but NOT poults) might appreciate access to a kiddie pool full of fresh water when it’s hot out.